The GoldenSprint Challenge Invitational is in the books. With athletes from both the College and the Highschool ranks getting together to chase the top marks, the meet was a success and great times were had by all. 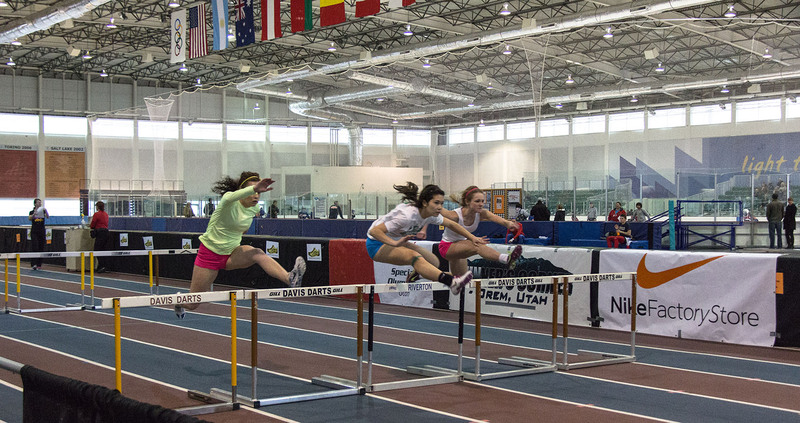 In the 60m hurdles, Nicole laws from Provo won the finals with a time of 9.26 beating out Christine Van Brocklin of Davis. Laws’ time in the prelims was actually faster at 9.13 which is her second best time of the season. In the Girls 60m Dash, Fatou Trawally of Skyline stood toe to toe with the college girls and actually had pretty good success with it. She ended up 4th behind a BYU 1-2 finish. Nicole Laws came back from her 60H win to place 5th in the 60m Dash. The results of the Girls 200m dash looked very similar as the BYU Duo of Gowar and Jensen went 1-2 again, this time swapping podium spots. Nicole Laws was again 5th in this event capping of a triple against some very good competition. Mackenzie Bindrup was 2nd of the Highschool Athletes just behind laws. They ran 26.73 and 26.88 respectively. In the 400m Dash Lily Huntsman of Highland won, nearly breaking 60 with a final time of 1:00.96. she was followed by a few college athletes and then Mackenzie Bindrup of Northridge. Again in the Boys events the college competitors took home most of the hardware but some Utah High School boys were able to bring it against the big boys pretty well. In the 60m dash finals, Seth Fortin showed that speed trumps experience, as he beat all competitors in a sensational 7.01 which is just .09 off his personal best. Behind him was Dak Kleven and then Sean Barton of Woods Cross. Parker Landgren was the 3rd of the HS Boys. In the boys 60m Hurdles it came down to the photo at the finish, and the athletes were separated but less than 1/100th of a second. Former Payson star and current UVU Wolverine Chandler Rieske took home top honors. His time of 8.62 is an unconfirmed PR. Also running 8.62 and placing 2nd was Kyle Strauss. Cooper Smith of Freemont was the top High School Athlete at 8.73. In the 200m dash Parker Landgren came back from his 4th place finish in the 60 to grab 2nd overall with a 22.55. In the 400 meter dash, former Skyline standout Andy Rounds ran away with the meet in 48.68. Blake Ellis of Lone Peak was able to grab 3rd with a time of 50.86 and Talem Franco of Wasatch was 4th in 51.51.